For loggerhead sea turtles, home is where your (magnetic) heart is. After hatching on beaches around the world, these huge marine reptiles undertake multiyear, epic migrations at sea. Then, the turtles return to the exact spot where they were born to mate and lay their own eggs. Now a new study has the answer: The turtles also rely on Earth's magnetic field to find their way home. That's because each part of the coastline has its own magnetic signature, which the animals remember and later use as an internal compass. 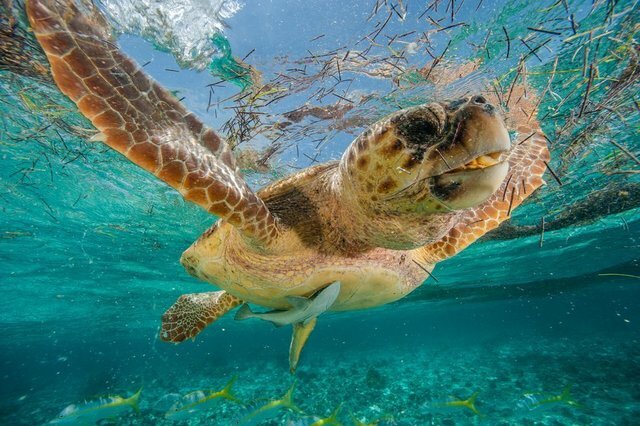 It's not an easy commute, though-the magnetic field changes slowly, and loggerheads have to shift their nesting sites in response, according to the study, published January 15 in Current Biology. "It's pretty fascinating how these creatures can find their way through this vast expanse of nothing," said study co-author J. Roger Brothers, a biology graduate student at the University of North Carolina, Chapel Hill. Though they travel hundreds of miles out to sea, the carnivores seem to prefer coastal habitats, and are the most abundant of all marine turtle species in U.S. waters. Every year, thousands of volunteers walk along Florida's sandy beaches to count loggerhead nesting sites, which provides scientists with a rich population data set. At the same time, researchers have been tracking subtle shifts in Earth's magnetic field along Florida's coasts, using compasses to measure how the field's strength and other properties change over time. Brothers and colleagues combined the citizen-science data on turtle nests and official data about the magnetic field to create a dynamic map, which showed how each variable changed over time. Their results supported their hypothesis: The loggerhead sea turtle nests moved in tandem with the shifts in the magnetic field.